It's not like I need the strawberries. I grew lots this spring and I still have leftovers from last year in the freezer, waiting for me to have two spare minutes to rub together long enough to make jam. But at this point it's tradition. Caitlyn and I join some friends, we drive up to Skagit Valley, we pick too many berries and we finish with fresh strawberry milkshakes. This year, our late-June was packed. We didn't make it up to the berry farm until after July 4th, only to discover that the strawberries were done. Spring was gorgeous here this year and then there was the heat wave a week or so ago. Sometimes the strawberries last into July, but not this year. 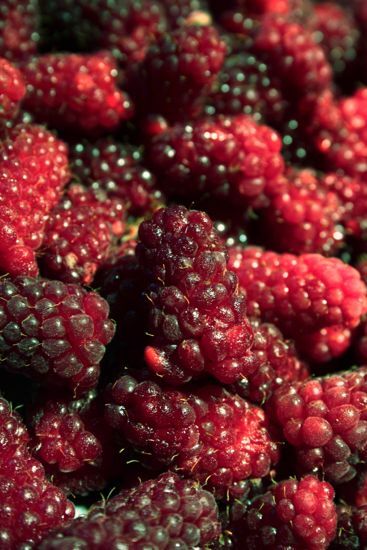 On the plus side, there were raspberries and tayberries and marionberries for the picking. We may have missed the strawberries, but we still got to make our way down berry aisles, eating as we picked. 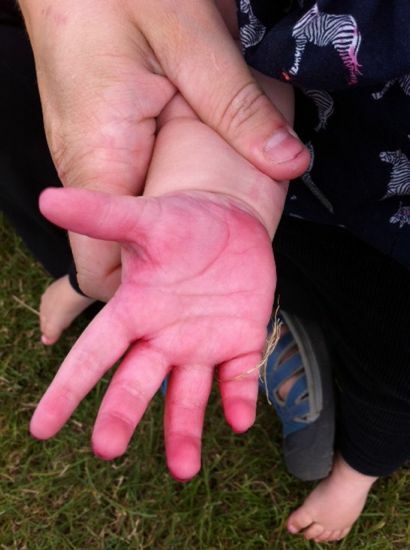 Even the baby's hands are stained with juice. So it was a win of an outing. And there were still milkshakes.